Deb’s works are deeply grounded in the specific experience of Bengal in the 20th century, of the mass traumas that it experienced, as well as an expansive vision both of the rich cultural past and of the political possibilities for the future. The “Testimony of Tolerance” series contains woodcut prints which were done in reaction to the killings of Mohammad Akhlaq, M. M. Kalburgi, Narendra Dabholkar and Govind Pansare. Though his paintings are full of hypocrisy and violence, and rife with dark satire, rather than focussing on the negative aspects of our modern barbarism, with its depression, fear and helplessness, he focuses on the possibilities contained in another age. Through woodcuts of Hafiz, Kabir, Baba Farid, Chaitanya, Mirabai and Tukaram, he aims at bringing these alternative narratives of tolerance and mutual understanding into the contemporary space. Amoung others, the series features contemporary figures who connect us to these humanistic traditions, who speak in other voices, and against the barbarism which always seeks to divide society. One finds Mohammad Iqbal dreaming of Guru Nanak and Moinuddin Chisti and the American civil rights leader Martin Luther King in dialogue with Vietnamese folk hero Nguyen Van Troi. These images carry no message; rather they seek to open up a dialogue of possibilities which the past provides for us to move forward into another future. In addition to woodcuts and sculptures, Deb’s watercolours and books are also showcased. Politics, literature and art all come together in these books, which deploy popular and comic idioms to narrate the human condition in the 20th century. 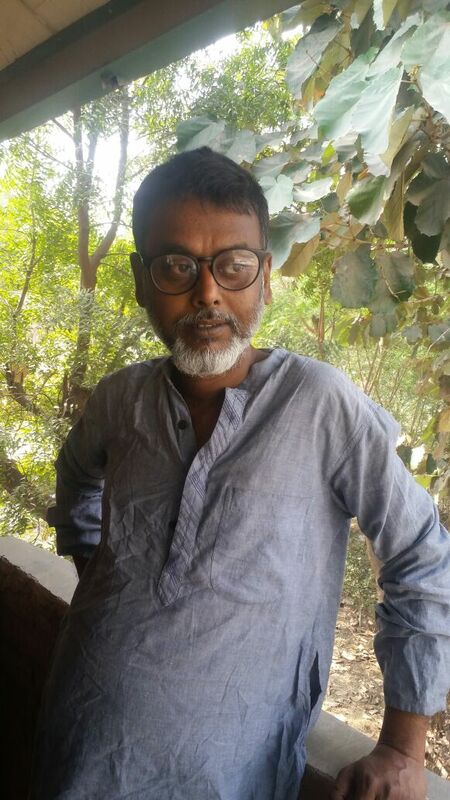 His watercolours comprise cinema panels of a nonexistent film featuring Sadat Hasan Manto and Ritwik Ghatak, titled Ma Tujhe Salaam, which are inspired by shots in iconic films by Ritwik Ghatak and others. For Rajesh Deb woodcuts or painting or visual art as a whole are merely tools for him to communicate his way of seeing the world more effectively. Whether sculpture, installation, book or woodcut, they are intended to disturb and to jolt us from the nightmare of history from which we are yet to awake.